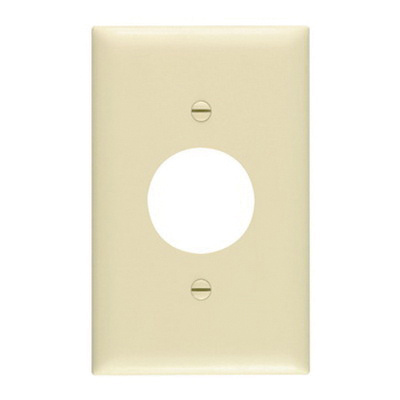 Pass & Seymour TradeMaster® 1-Gang Standard size single power outlet wallplate in gray color, features rugged nylon construction. This rectangle wallplate measures 2.9375-Inch x 4.6875-Inch x 0.070-Inch. It has one single receptacle configuration. It is UL94 V2 flammability rated to withstand harsh environmental conditions. It is suitable for hospital, industrial, institutional and other high-abuse applications. Wallplate is cULus listed and RoHS compliant.